Internationally recognized for her watercolor images, Barbara Moore's unique ability to capture realistic scenes from the peaks of the Rocky Mountains to the historic streets of Old Town, Fort Collins, Colorado, creates a lasting impression for generations to enjoy. Barbara Moore's watercolor paintings are owned by collectors in Europe, Japan, Canada and across the United States. The following are just a few of her many awards and honors she has received over the years. Barbara Moore has recently published a book featuring her award winning paintings. 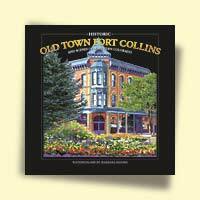 This book is a unique collection of her favorite pieces that capture Historic Old Town Fort Collins and scenes of Northern Colorado. Look for it on the shelves in Fort Collins and surrounding areas.